The sat.nav. 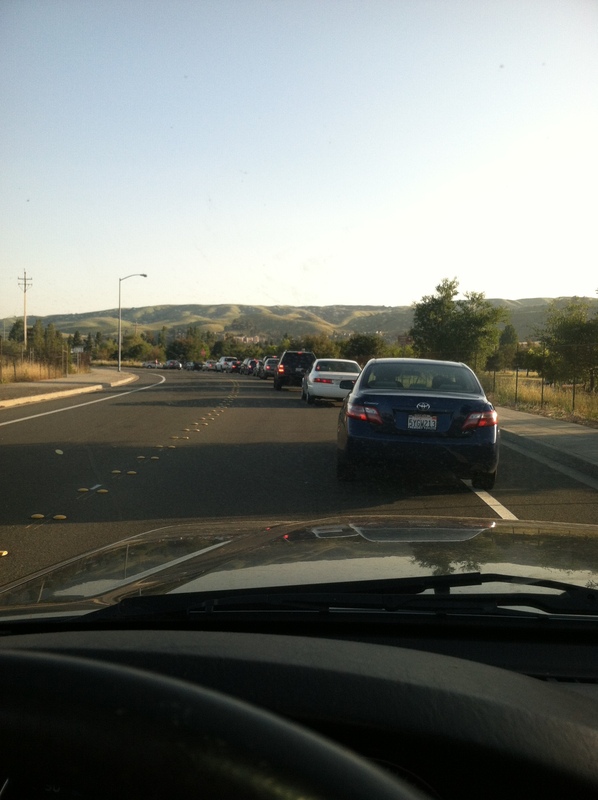 in the car assured me I would get to the race by 7am. Not ideal (I had taken a little detour by mistake ahem) but ok for a 7.30am start. Then I joined the jam outside the Quarry Recreation Centre. Cars were backed up in two directions, sloooooooooooowly funneling into the park entrance – and each stopping at a booth to pay for parking. I didn’t know the area well enough to try to park elsewhere and jog to the start as I saw other people do …so I sat there, gazing forlornly at the giant inflatable start funnel bobbing around on the horizon. Most of the cars were full of competent, calm people – arriving in good time for the half marathon and other races which started 30 mins later. There was no saving one frantic little marathon hopeful. I parked with literally 5 mins to go, ran to pick up my race bib and chip and lumbered off to the toilets where a sympathetic line of half marathoners took mercy on me and let me go ahead of them. In the background the tannoy reached an excited pitch asking if everyone was ready ‘Yes’ the crowd cheered, ‘No’ I whimpered. As the race started I still had to tackle the fiddly business of attaching the timing chip strip to my shoe. I finally got it done, clambered over bunting to get into the now deserted race start funnel and careered through it painfully conscious of how comical I must look – a disheveled, panicked idiot. 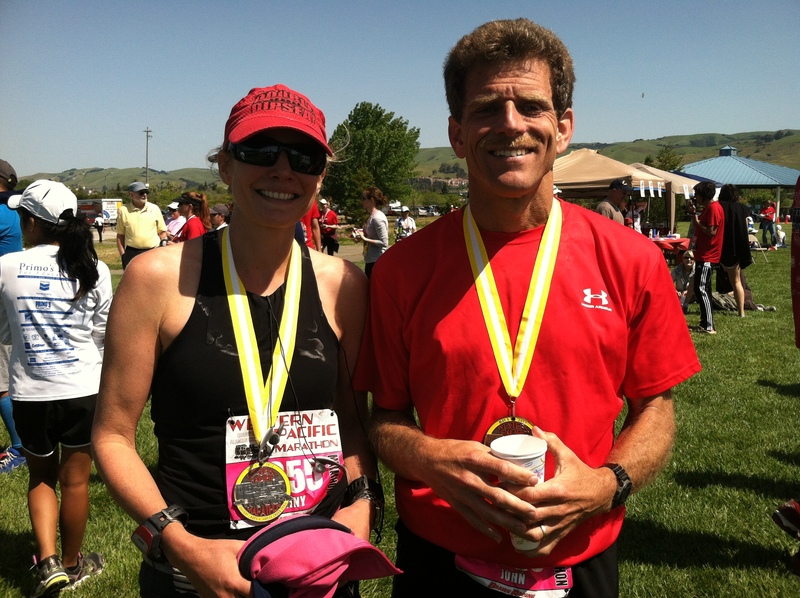 I was holding my Garmin in my teeth, stuffing the course map down my top, juggling my ipod and hanky while trying to detangle my headphones ….after a few minutes of running they had snarled into the tightest knot I have ever encountered. There are two major benefits of starting like this and one drawback. On the plus side you have your own little send off (I received a special little round of cheers) and then you are so insulated with gratitude to have made it and mortification to have caused a public spectacle you don’t feel the first few miles at all. In this case my mind was also fully occupied with the process of picking away at headphones wires. I was lucky it was a flat fire road/path race. If it had been a trail on single track I would have been in the soup. On the negative side, the luck of the Irish will always ensure that if I start a race late my chip will not work. I passed my friend Chris Jones and waved my knotted headphones at him. We had the most typical runners’ conversation in the world. I asked after his ankle injury. He asked after my back. I warned him not to push it to hard and risk damaging that ankle, and he warned me about my back. Then off we went to mess up our ankles and backs by running a marathon on them. The difference between us is that 5.30am the next morning Chris would be treating his ankle to the OC Marathon. I love it when people make me look normal. 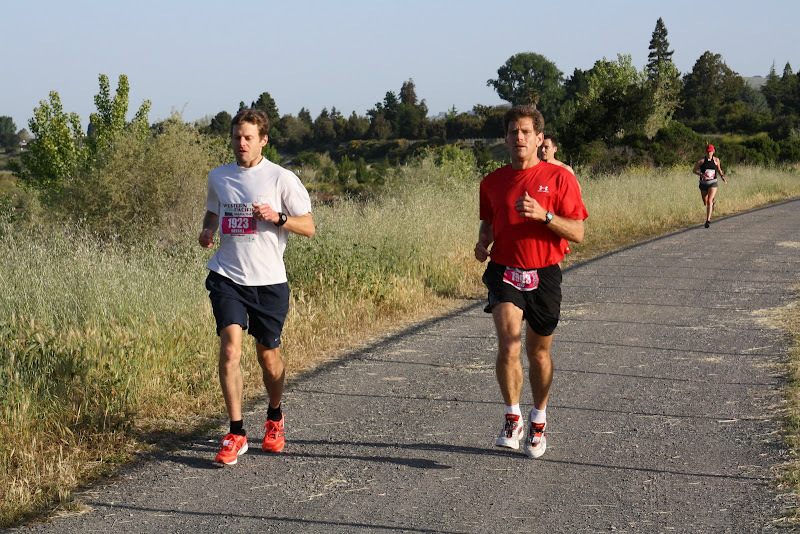 When I caught up to John (red shirt) and Russell (white shirt) I fell into stride with them and we ran much of the distance to the 13 mile turn around point together. It was funny they were comfortable at the same speed because I was struck by how comically different their running styles were as I approached them. Russell is what I call a Darth Vader runner – they sort of glide along close to the ground hardly lifting their feet while John is one of the bounciest runners I have ever seen, he lifts his heel higher than his knee with every step, often close to hitting his thigh -I guess Russell would need to see a rattle snake to achieve that height. No style is right or wrong of course – each to his own. In the picture here I am catching up to them. In the end this is the order we finished in. 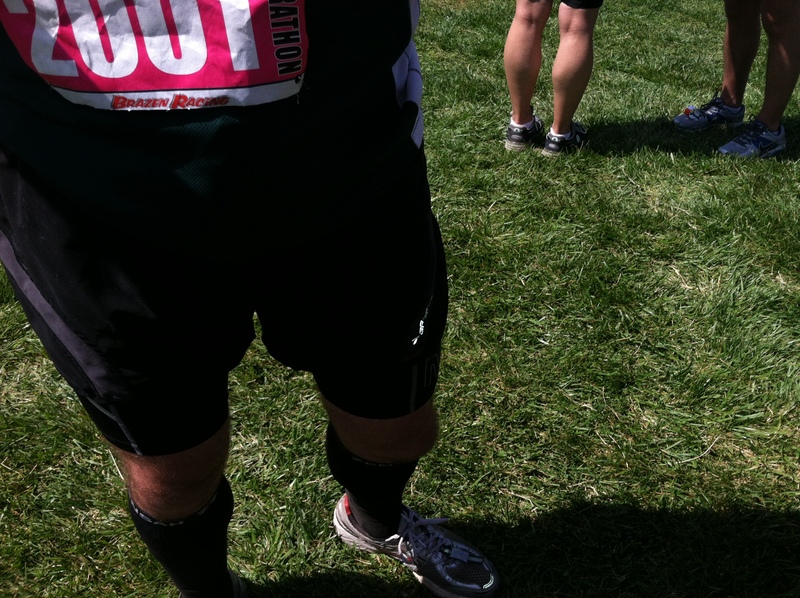 John got frisky around mile 17 and breezed so far ahead he was able to wave at us from the other side of lake. 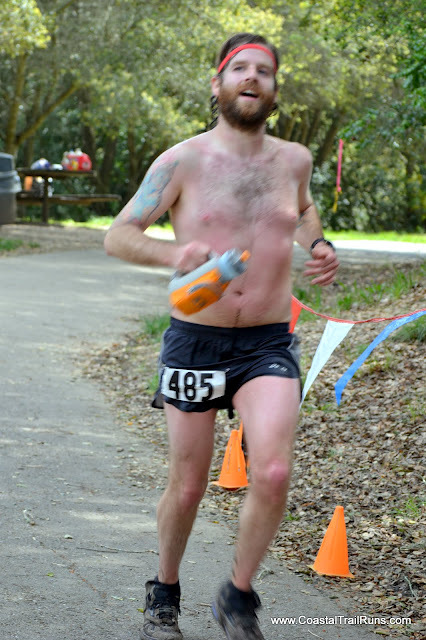 Russell got a second wind around mile 24 and stormed by him to strong finish in 5th place. (John and I believe he deployed the magical powers of his mesmorizing bright orange shoes.) Our times were 3.19.57, 3.19.29 and 3.19.58 respectively. Kinda sweet. They were great guys and we had a few laughs and adventures on the way. At one point we jogged up behind a man dressed entirely in yellow and black and considered making bee buzzing noises as we passed by, but he looked like he was suffering a bit so we just ran up to him and told him we thought he looked like a bumble bee. As soon as he laughed I had my suspicions and when he spoke ‘me stomach’s killin me’ I realised he was from Northern Ireland like myself (from Newcastle, close to my hometown Bangor) We high fived and cheered for Newcastle/Bangor every time we passed after that. I had worried I would find this course dull. Flat stuff by a quarry does sound grim. However, the place was really interesting. The quarry was filled with water in some places and marshland in others, the path crossed a few bridges and dipped under more so there was some variety and lots of things to look at – dog walkers, cyclists, squirrels, ducks and other birds. Above all, the set up of the turn around aid station just stole the show for me. It was at the very end of a long spit of walkway, gorgeous marshland stretched off for miles on either side. The station itself was a burst of color on the horizon and as you ran towards it and the smiling volunteers manning it you couldn’t help feel a little elated. The weather added to the special atmosphere here too. There was no shelter on this stretch and the sun was bright and hot – but there was the most glorious cool breeze. The combination just made my skin feel like silk. Truly memorable. The marathon return retraced our steps. 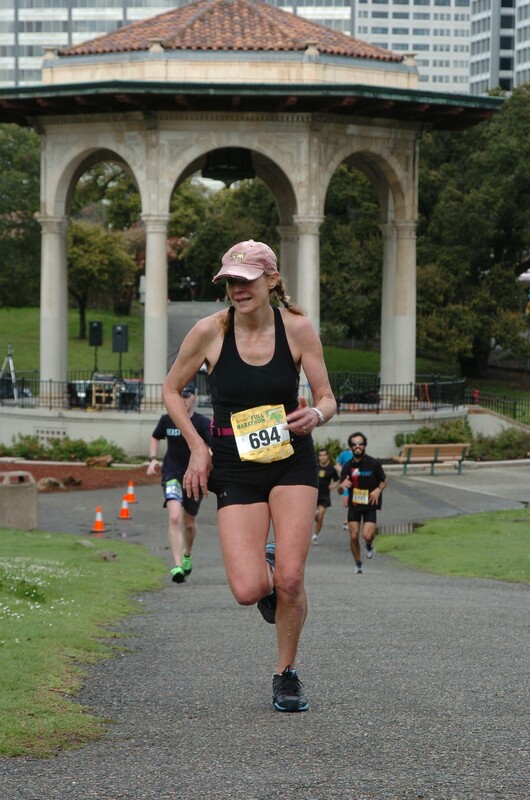 There were buoyant exchanges with inbound and outbound marathoners greeting each other, I looked out for Chris and Mr Bumble Bee and was of course interested to see if there were any females in front of me or sneaking up behind me. There actually weren’t any ladies ahead or very close to me which takes away the thrill of competition but does allow you to relax and run in your comfort zone -and considering my back problems that is what I am supposed to be doing! We soon reached a bigger field of runners as we met with the half marathoners. It was a welcome mental lift to have lots of people to watch but at times hard to get comfortable in your stride as you have to keep weaving around people. Around mile 21 the half marathoners sail off downhill to the finish and he marathoners are sent as if in disgrace on a punishing little two mile detour along a straight, seemingly unending and fairly featureless lake side path. 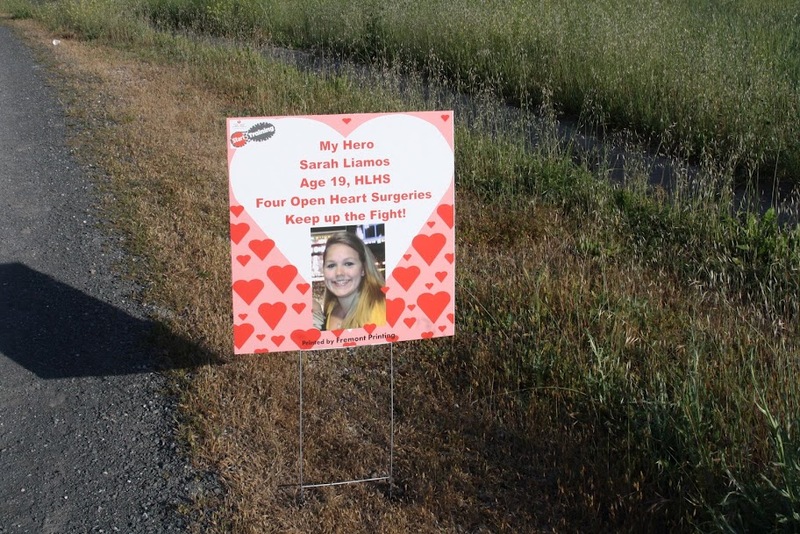 I looked at the mile 22 sign beside me and eyed the back of the mile 24 one across the track…I felt on the whole it might be more fun to fast forward the next little section of my life…and indeed these were the toughest two miles for most of us. I was praying to see the people I knew were ahead of me coming back towards the finish …you know you need body count coming back before it is possible for you to get to the turnaround. Eventually I saw the leading man, Doug.. yay. He looked very strong, so strong indeed I told him later I considered tripping him up – but he said he was really suffering at that point. I also saw Nakia Baird who was to come in 4th man at all these little interactions. He certainly deserves an honorable mention as I later found out he has had 4 knee surgerie..so I took a photo of them (see pic). The option of cutting out running has not yet occurred to him! It was so great to see John and Russell, both looking comfortable and determined, Russell just getting ready to unleash his last hurrah. I took a sports drink at the mile 23 aid station and attempted to stagger around the turn around cone while consuming it and promptly threw it into my eye (unless I stop I am just hopeless with those paper cups) so I headed off on the return winking vigorously at the people coming up behind me and trying to preserve my contact lens. I normally carry a spare contact lens in the pocket of my water bottle. When I went to take a sip of water at mile 5 I realised both water and lens were sitting on my car. The finish was great, the course swoops down and around paths leading by an artificial beach and you can see the colorful finishers’ tunnel and aid area ready to welcome you home. I especially like that the course returns on a different path to the start route. I was really on fumes at this point and my back was very sore, I kept my eyes on John’s red shirt (still bouncing up and down in a lively fashion) a good way ahead of me …a friendly back if not face to lead me home like a harbor light. On the final turn John was out of view but I smiled when I heard a little cheer and announcement as he crossed the line. Now at this point I have to admit I started anticipating the slightly childish but very human joy to be had in finishing a marathon as the first lady. I have been fortunate to have the experience before and they do sometimes make a bit of a fuss of you. So though I knew my family would not be there, I crossed the line ready to perhaps wave and don an ‘oh it was nothing’ expression while savoring a tender moment of personal pride in response to strangers cheering. And then I shot through the funnel to complete silence. It was so silent I wondered if I may have taken a wrong turn until a smiling lady greeted me and we started sorting out my medal. When she realised I was the first lady in the full marathon she headed off towards the tannoy operator to insist that he made an announcement. A few minutes later he did so but unfortunately ended with ‘congratulations first lady MELANIE SOANDSO.’ So here was the silliest finish in my running career. A couple of people high fived me and said ‘well done Melanie’… you can’t really not respond to a high five but in doing so you are kind of agreeing that your name is Melanie. Simultaneously I heard John’s voice saying..’.I thought you said you were called Penny?’ And ahead of me I could see the smiling lady returning with a ‘ THAT’s better’ expression on her face ………….and I’m think oh dear, how am I going to break it to her … It suddenly also seemed hilarious that we all had our names written on our chests in block capitals. It was hysterical. Bless her, off she went striding purposely back towards the tannoy. In the end it emerged that this company has a policy of only using the gun start time for the first three male and female runners home for each event (its probably a common thing and it does make sense). So I needn’t have bothered struggling to put the chip thing on. It did turn out there was a problem with the chip technology- just covering a series of numbers including mine – how typical of me ….see luck of Irish rule at top of this blog. This problem also scrambled names – hence the Melanie. 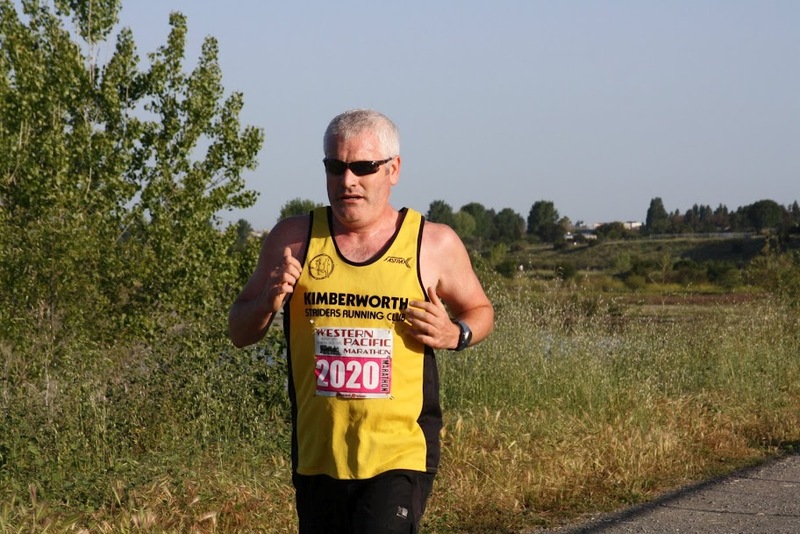 To be honest I thought John was called Brian for some reason, I started calling him John because that is what is written on his bib in the photos….and now see he is listed in the results as David. I wonder. 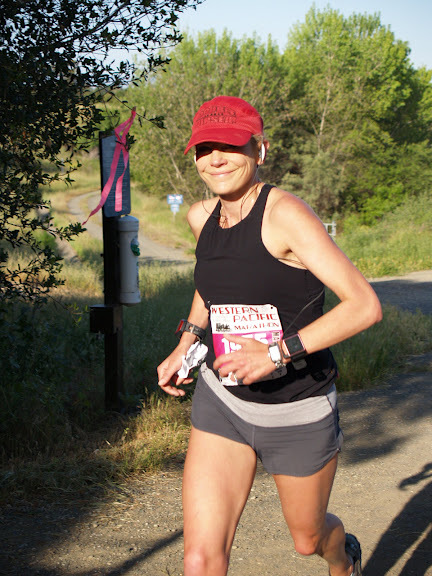 Overall I was delighted that I did this event, I was genuinely surprised at the beauty of the course …and the people were wonderful, runners and organizers. I think I’ve won a pair of shoes. The next humiliation will be when they have to tell me they don’t have any wide enough to cope with my huge bunions. Unforgettable. 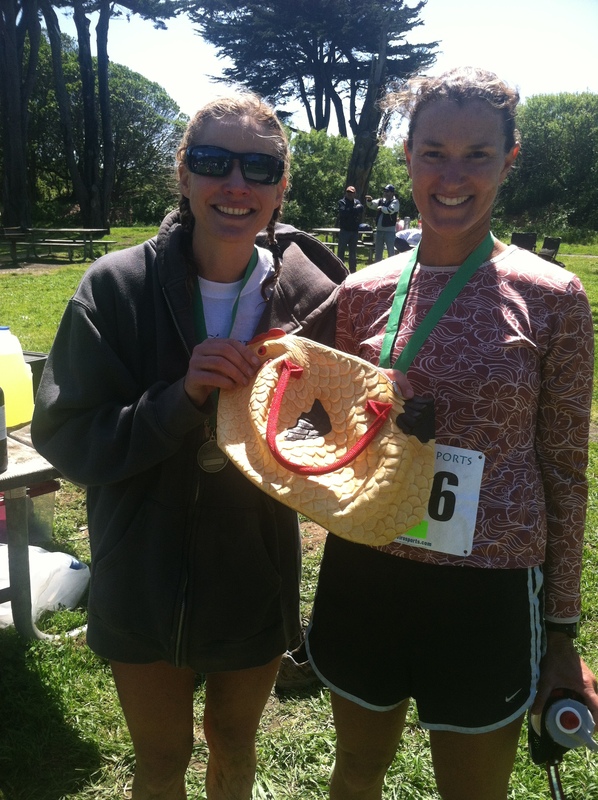 Bounce around a trail marathon in Muir Woods, win a Chicken handbag – then stagger into the sea at Stinson. I sneaked this marathon in. It was close to home, in a beautiful place. 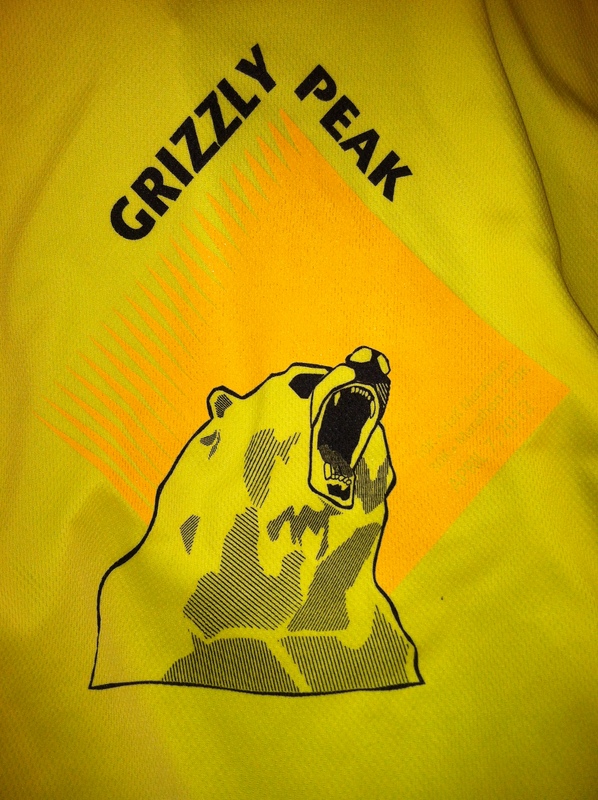 Hard to resist even though I did the Grizzly Peak trail marathon last weekend. AND it worked well to have dead taper this week (virtually no running) as it was Spring Break for the kids. So I arrived at Stinson at 8am, feeling a little more nervous than usual – knowing I might just fizzle and not be able to complete the thing. 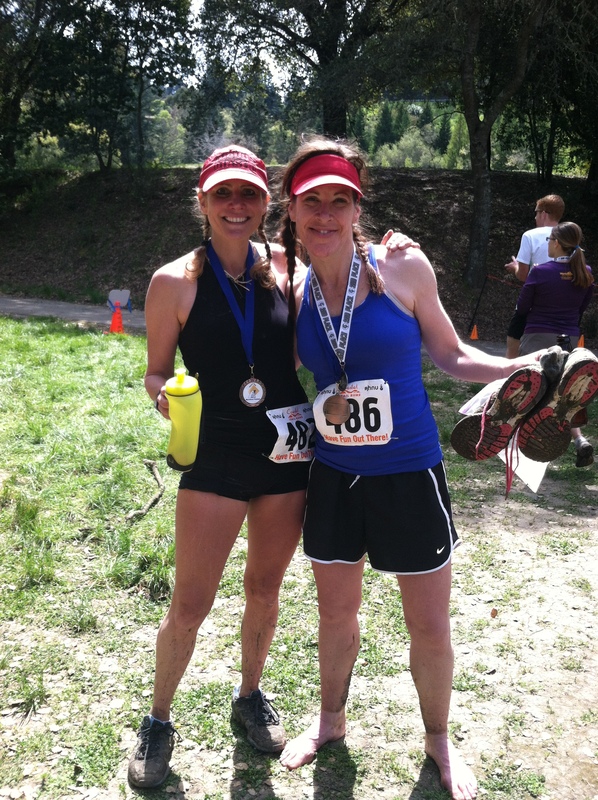 I have done two marathons a week apart before – but only a trail marathon followed by a road race, not two trails. Part of me was genuinely interested to see what my body would do ..like a scientific experiment ..one possibly involving cruelty to an animal, namely me. I set out to have a go but promised I would call it quits if I started hallucinating or crawling. 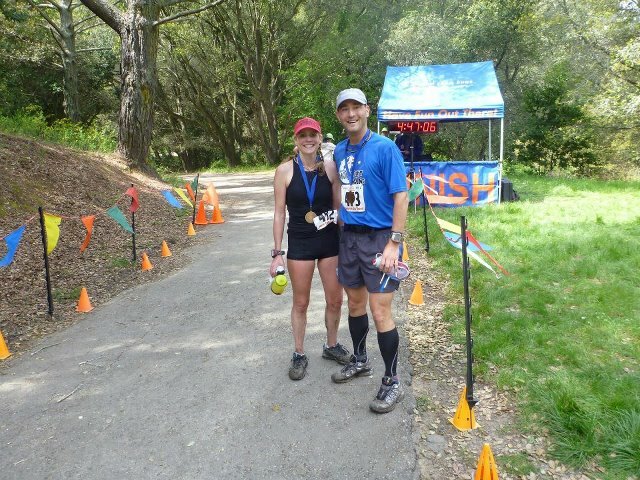 Initially I relieved the tension by telling as many people as possible (some of them trying to get away from me, just walking their dogs on the beach) that I had run a marathon last week so that I could be remembered for the bravery of my start rather than the saddness of my decline later…” Did you hear a girl fell asleep at mile 11″?..but was soon seduced by the friendly atmosphere and was glad I had come. I compared my morning’s caffeine consumption with some other runners (my quadruple shot latte won) and was just joking it might not be enough when I came upon a stash of energy drinks. I drank one of them too. Delicious! I was committed now. If I didn’t do at least some kind of significant run I would not sleep or stop talking for days! 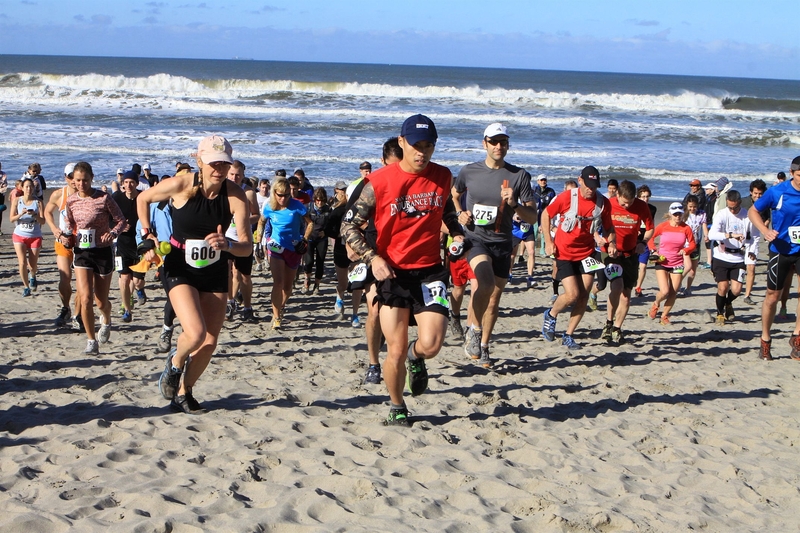 I very much admire this running company Envirosports. In my mind the chief organiser Dave and his team strike a perfect balance between keeping things relaxed, fun, welcoming and supportive to first timers and those who intend to take it slow or are unsure how they will fare – and yet exude a sense of being professional, competitive and serious enough to attract some good runners and urge them to do their best. They are also mean enough to plot race courses that are lung poppingly challenging – and they enjoy laughing about it before they send you off to experience it!! It is also a caring organisation. These guys have excellent aid stations and medical support. 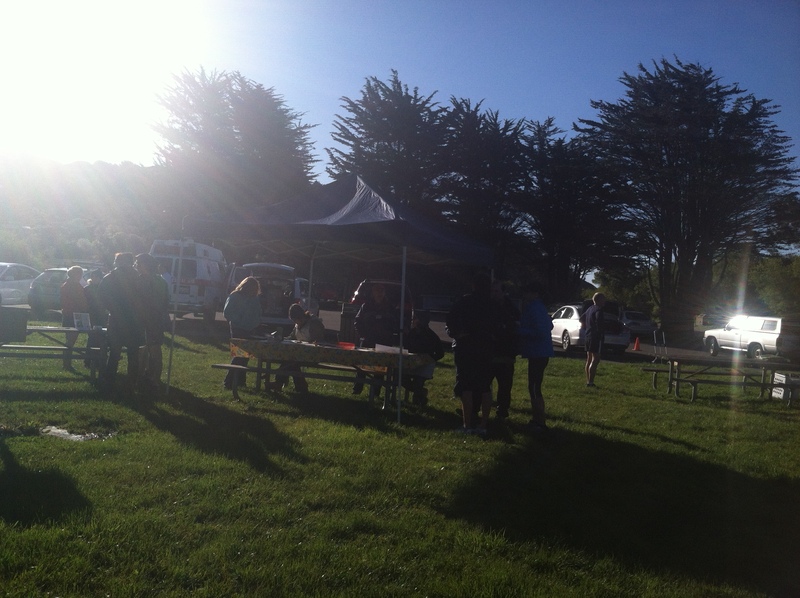 They start races late if there is a queue for the rest rooms and they take the trouble to introduce runners to each other if they spot a connection …like an Irish accent. You don’t feel alone very long if you arrive to race with these guys as a solo runner. Dave kicked off the event with his usual lively talk and – as is traditional for him – drew people from the crowd, made them stand on a picnic table while he told their story (this time it was a couple celebrating their wedding anniversary with their 40th race together) and then thanked them for coming along to lead us in ‘The Star Spangled Banner’. What is funny is that it horrifies people for a minute but they always make a stab at it and of course as soon as they start the crowd joins in. Dave also works the crowd into a frenzy of excitement by showing the rubber chickens and chicken handbags given to first men and women respectively in each race distance. The crowd of c 300 runners then moves en masse down to the beach for the start. Everyone is happy and relaxed, strangers chatting to each other – lovely atmosphere. We had a funny start. Running uphill on sand is hard and I pushed hard to get it over with quickly and to ensure I would be one of the front runners as it is not long before the race hits single track and you don’t want to be caught behind slower people. I found myself right behind the leading man only to discover he didn’t know where to go – and it is a little confusing at the very start – so I used up a lot of precious lung capacity shouting directions at him and laughing because he was a directionless ball of energy running around like a headless chicken. Once I got him across the parking lot and over a little bridge onto the main road he flew away, the rest was as always a very clearly marked trail. The race itself is mentally relaxing as you are nearly always on a long stretch with no turn offs to worry about. Physically – not so relaxing. 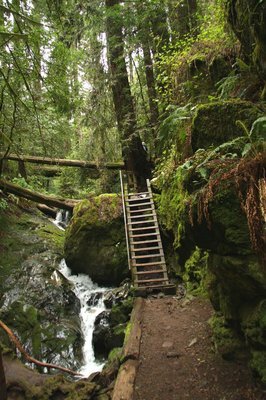 The first section, aptly named Steep Ravine is ludicrously pretty but indeed steeeeeeeeeeeeeep and even features the much loved ladder pictured here. Dave informs us that a local woman is able to run up it hands free. I was virtually breath free scrambling up it but used definately used two hands! As I got to the Pantoll Rangers station at the top of Steep Ravine there were just four men ahead of me. I passed a party of 15 rather jovial hikers, some not in the first flush of youth, starting their descent of the ravine. I felt a little bad for them. I hoped their party spirit would survive standing aside for the 295 runners I could see in their near future. My future on the contrary was positively rosy as Pantoll signals the start of a glorious and prolonged swoop downhill for c3 miles on the Dipsea trail to meet the Muir Woods road. A good time to take in fuel like an energy gel as what goes down must go up. 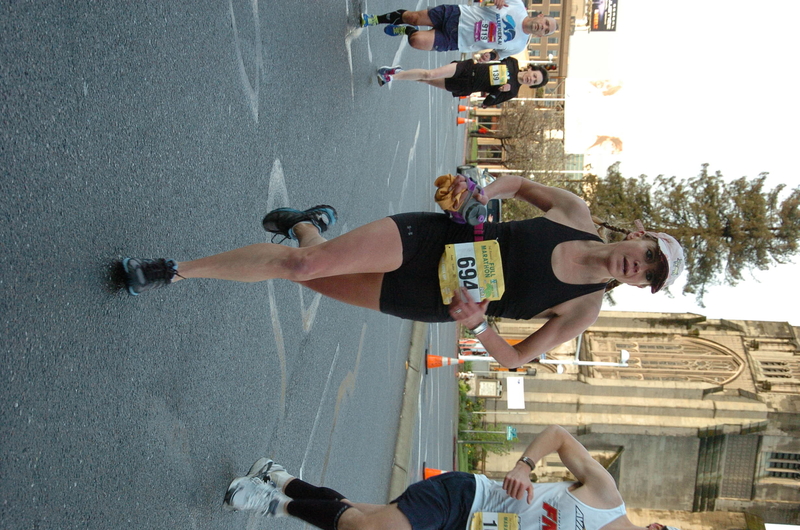 Once on the flat, marathoners wind uphill on a four mile out and back. The lower sections are lush forest, in places extremely muddy and generously endowed with horse poo. As you progress to the top the vegetation becomes exposed hillside grass. It was a happy moment turning back from the aid station at the top of it, good not onlyto be going downhill but also to be plunging back to the deep dark forest. This turn around also gives you a chance to see how many runners are ahead of you and to assess how fresh the meat is creeping up behind and threatening to shatter your dreams of chicken handbag ownership. There was just one lady maybe a quarter of a mile behind me – this was a fun and smiley looking Michelle who was to be the second lady and we were to keep those places for the duration. On the way down I ate another gel as I knew the hideousness that is the steep crawl up the infamous Heather Cut Off lay ahead. So up the Heather Cut Off I went, starting to pass an increasing number of half marathoners and was – as often – struck and charmed by the sincere generosity of spirit that leads so very many people to cheer you on as you do so. 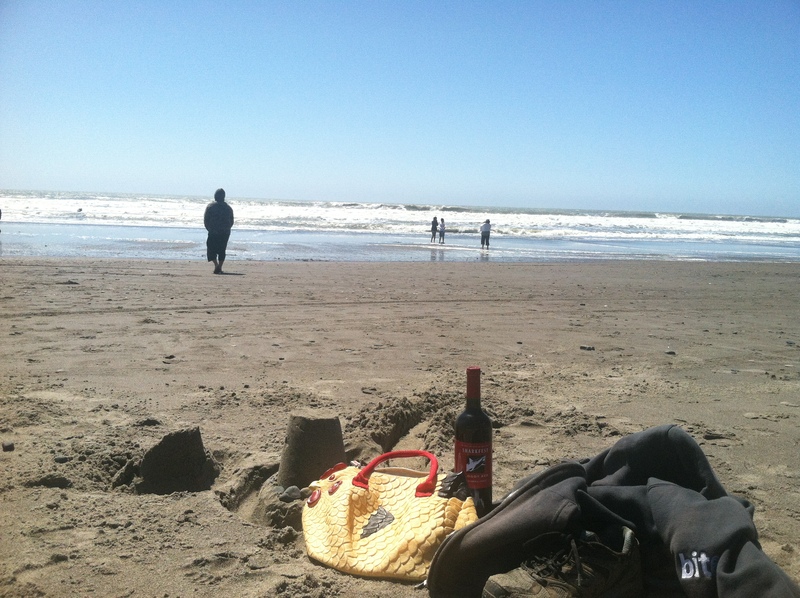 This is very Californian and very lovely. The odd person doesn’t want to be overtaken or doesn’t understand that is what is supposed to happen and makes the mistake of speeding up ahead of you, running beyond what is right for them then inevitably flings themselves to one side in a dead stop – and you know you have messed up the hill for them. Although I hate to admit I think I would probably have a natural tendancies towards the second. Marathoners know they have to deal with The Heather Cut Off twice as they loop around it a second time. So the best you can do is pull your hat down, think of the few steps ahead of you rather that the entire slope, get yourself into a good breathing rythmn (I favor the beat of ‘Ompa pa Ompa pa’ breathing out on the Oms and in on the pa pas) and start looking out for little features to look forward to and check off the next time around. Two little mushrooms, a particular flower, a picnic table, people to recall in a particular place and wonder where they have got to when you return but they have gone, a tree shaded bit etc. The second tree shaded section is celebration time as you are near the top. Reaching the aid station you gaze lovingly at the ‘to finish’ sign the half marthoners are heading for on the left and instead turn right, tank up with fluids and sail down that long Dipsea trail back to the Muir Woods road again- and again stuff in a gel pack in preparation for Heather. The first time you cross this road it is empty, by this time it is lined with cars as people are literally queuing for miles along this road and walking back to the main entrance to Muir Woods. 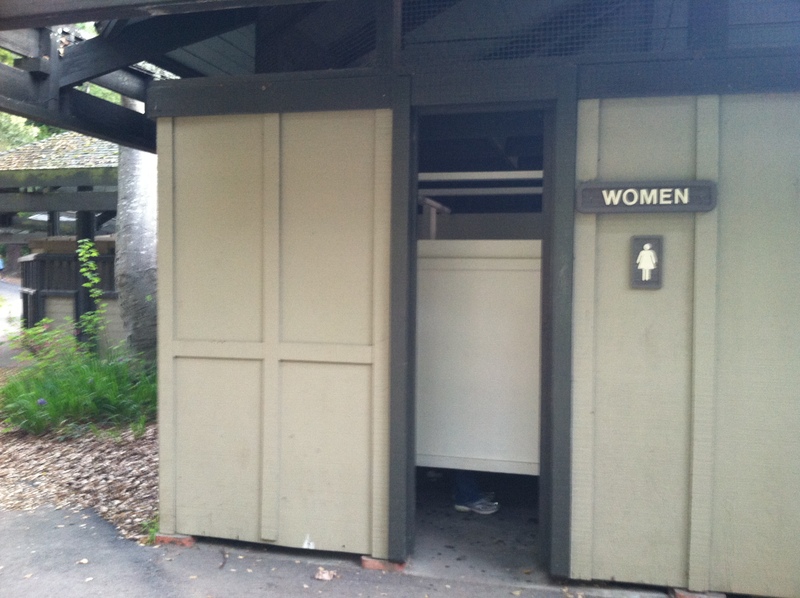 Dave always tells people they will know when they are near the ‘offical’ entrance to Muir Woods as they will start to see people in forest in high heels. I laughed to myself as I crossed the road just before a party of three ladies in high heels. Doubtless they were horrified by my appearance – but I hoped my feet would be more comfortable than theirs that night. So back up Heather you trot. She is just as nasty as she was before and now you are more tired. One huge consolation though, the wind had got up and there was a wonderful cooling breeze. Enjoying this I promised myself I would continue the cooling process by running into the ocean I could see way down below if I survived the entire race. Reaching the top of Heather and heading back down Dipsea to home should be a great feeling. It IS preferable to being on Heather but I just regretted that my body wasn’t feeling more comfortable so I could enjoy it more, but my side and calves were cramping and it was hard to do much else apart from will it to be over..and soon it was. I was surprised to learn after I was second place in the marathon overall, I’m not sure where I overtook the other lead men, possibly at the Cardiac aid station at the top of Heather. The first man was in no danger of my doing so. He had been in possession of his rubber chicken and wine for a good 20 mins before I arrived, his time 3.55 …which is pretty nippy. My time was 4.14.59 and I was delighted with that. I had intended to run it not race it and if I had pushed it any further I may well have hit a wall at some point. I had kept it comfortable and manageable for myself. More importantly, I was chicken rich. 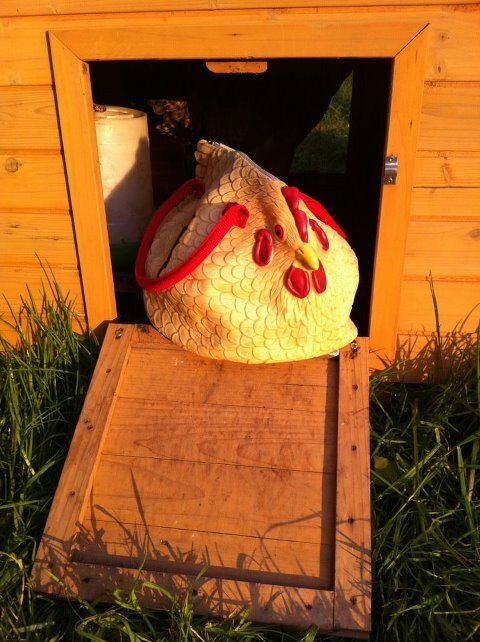 I had promised my friend Lucy (who keeps chickens in Ireland) that I would send her the bag if ever I won another. So she will be in the post on Monday. 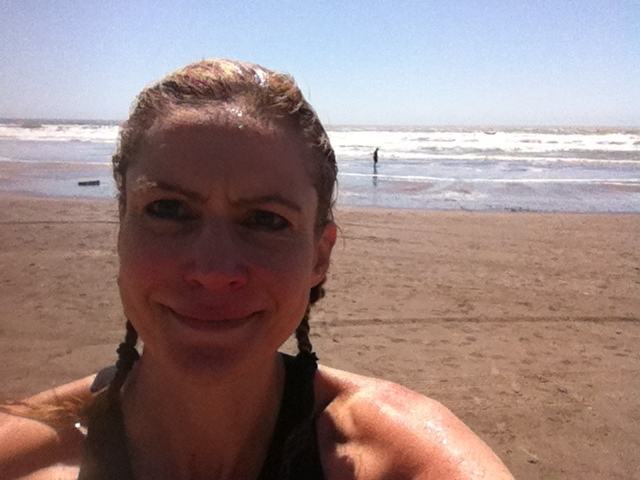 As promised I ran straight down to the beach and plunged into the sea. most-dangerous-cities-according-to-fbi/. I grew up near Belfast so I know what it is to love a community with a bad rep.
Oakland’s organizers requested no headphones and if you wear them you are ineligible for awards/prizes….and there were cash prizes five deep in the ladies positions and for the masters (first lady over 40). So …mmm..ok no ipod. Darn. I normally run trail, kinda grim prospect ..roady stuff without ear escapism. The weather was 100% chance of rain but I arrived to clear skies and worries about where to park also also evapourated as street parking was free on Sunday. I dented Oaklands economy but secured good karma by sharing this joy with line of drivers who were queuing for pay parking right beside a row of free-on-Sunday meters. Shortly after that a rat ran over my foot. Well let’s have that as a good omen – he kept up a strong pace as he rounded the corner. The race was interesting. I eyed the guy with a 3.10 pace sign on a stick ( if you stay with him you should complete the race in 3hrs 10mins) at the start and wondered if I should try to join his group. I’m a bit funny about numbers when it comes to running. I never time myself on mile splits, I rarely want to know how many miles I have done. 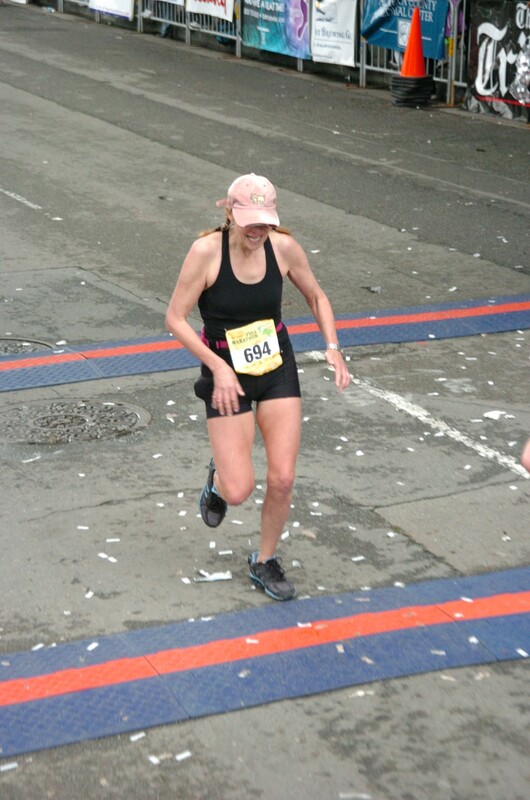 I just run a squeeze beyond what is comfortable and keep going until someone offers me wine or I see a finish line. After the first few miles they do send you up some surprisingly challenging hills. I could see there were some uppy bits building to mile 11 but nothing over 8oo ft ish. I wondered (mistakenly) if perhaps I might not notice them as my trail marathons often exceed 5/6000 ft. I passed Mr 3.10 and his cronies early on but they nibbled away at the ground between us as the hills continued and swooped by me, as did a perfect specimen of feminine beauty and athleticism which turned out to be Ms Monica Zhuang. 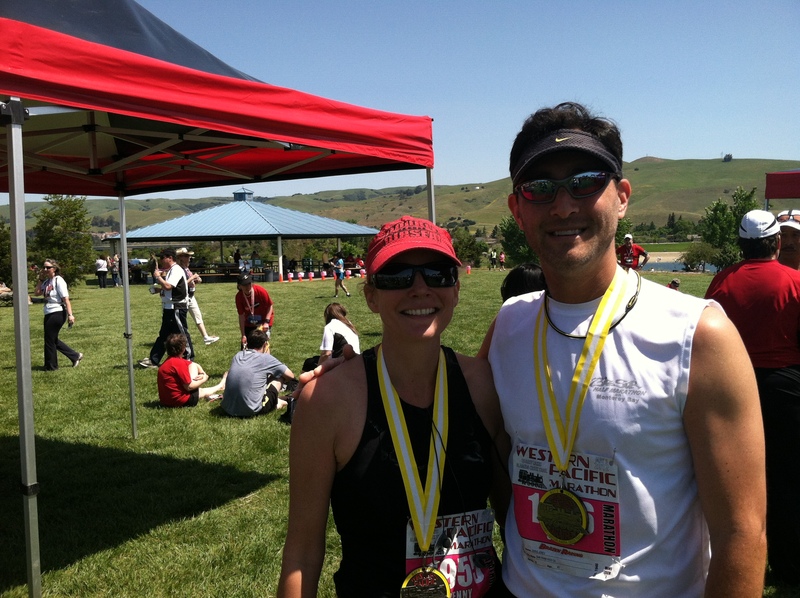 This was my first and final chance to meet her before she glided over the finish line as second lady. I resisted the temptation to chase them, believing in my natural feel and remembering the races where I have pushed too hard at the start only to fizzle later on. 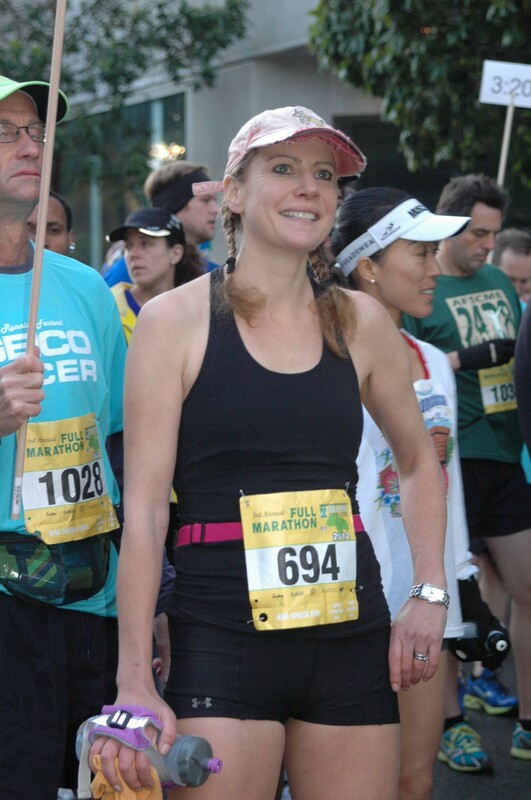 Really any marathon is about surviving first, times later. I don’t know why I found those hills so tough, you can’t dig your toes in and lean forward as you can on a steep trail and I wasn’t sure if I should be doing shorter or longer strides. All in all I began to feel rather small about my ‘ oh I’ll just cruise this little flat thing in 3 hoursish ’ thoughts. They did not return. Eventually we crowned the top of the last big hill around mile 12. A cheerful group of people with balloons shrieked ‘It’s all downhill from here’. This always amuses me in races for two reasons. 1) in any other context this expression would be bad news and 2) people who shout this are invariably unwittingly lying unless they are about an inch from the finish. I was chatting to two runners at this point, one of which knew the course well. He assured me there was a dramatic big long down from this point for 5 miles. One was a hills man, the other like me tends to do well on downs. Mr hills bade us goodbye as if he was dying and assured us we wouldn’t see him again as we crested the hill. And aha I could see Mr 3.10 ahead. My new friend and I both started thundering down to annihilate him. Just then I felt my back jolting and sparks of pain sprinkled down my right leg so I had to pull back. That was a bit sad. I seem to need to let my back sort of settle when I change from steep up to steep down on road. (I had 5 months off running with two torn discs in my back last year and am now on an active recovery where I treat them badly by running marathons then cajole them with heavyweight anti-inflammatories and by slathering on the Icy Heat. I do have to respect pain though and the repeated hitting on hard road is worse that trail stuff for it) My new pal also found his big downhill moment less fun than expected as he suddenly announced ‘oh dear’ and dropped out. I was however delighted to spot Mr hills positively cooking later on around mile 20. 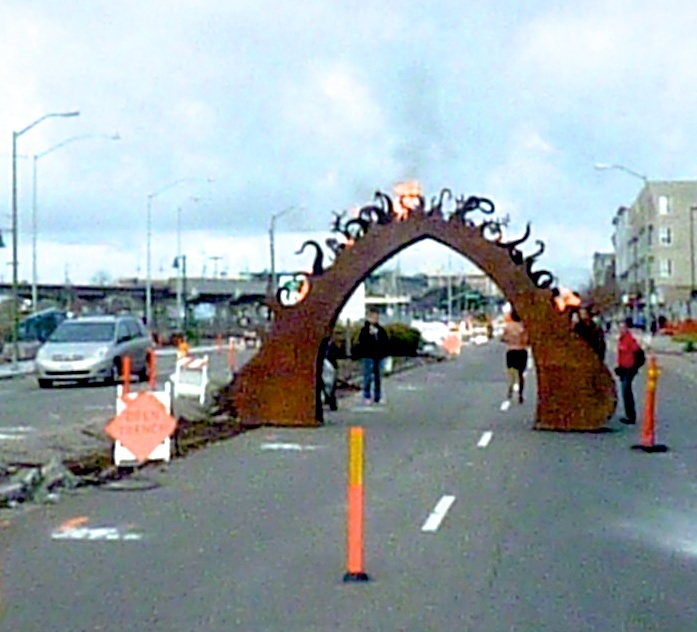 I did enjoy the local people and sights and sounds of downtown Oakland – loved the bit where you run through a flaming bridge. 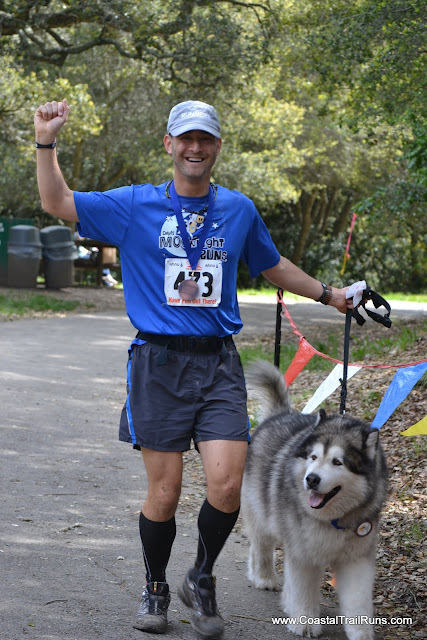 There were A LOT of policemen, and there were also more dogs – police and otherwise – than I have ever seen at a marathon before (which is hard for me as I want to stop and cuddle them all..I did pat a few). I wondered which streets were the ones that I would be ill-advised to walk down come nightfall. We had been lead to expect live music on virtually every street corner and that was certainly not the case and made the no headphones thing tougher for me – but I enjoyed what was there was and as always there were one or two little comments/exchanges with people that made the day memorable. A husky voice from an upper apartment said ‘Moma got tail’ …it may mean I have an impressively large behind but I didn’t ask for clarification. Sometimes it is hard to show you appreciate all the shouts of encouragement, but every single one helps a little when you are going through a tough time motivating yourself and I must say I did find this hard. I liked the sign ‘Pain is temporary, pride is forever’.I’m sure my back surgeon would like a little chat with the lady holding it. Alas purple water carrier. It was to be our last adventure together. By accident I overheard some people talking about Mr 3.10 as we hit mile 21 sign. It appears he had had to drop out due to suspected rest room needs. The news cheered me as I had been feeling a little glum he was not even in view in places where I could see well ahead. 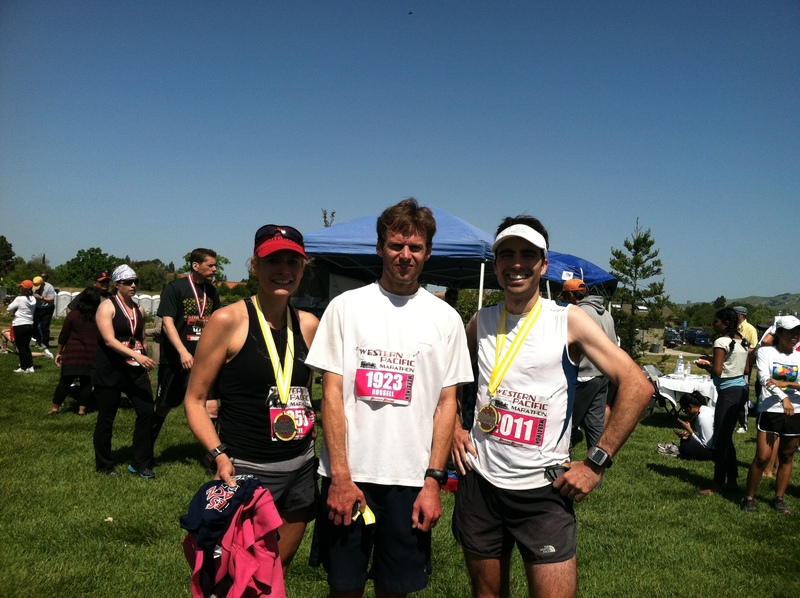 It turned out these people were running the 3.10ish pace so I was doing better than I had thought. To celebrate I decided to ditch my water carrier as it was empty and was hurting my hand. What an old fool I had bought a jaunty purple one at the expo …(I know, never race with something new, but it was pretty and had nice big zippy pockety bits). I lobbed it towards a group of children. Wonder what they made of my emergency contact lens and tampon. warning – I’m off on a history lesson here! 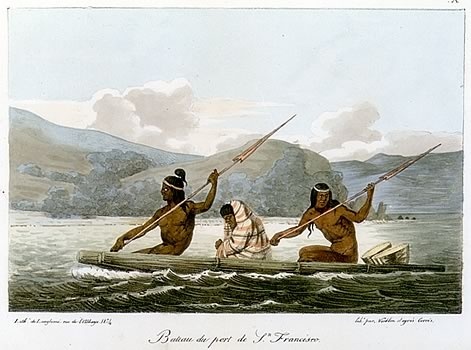 Ohlone Indians in the good ole days -um sorry guys, no boats. It’s a good sign when you can see the lake Merritt in this marathon. Funny to picture the Ohlone Indians who used to fish and hunt in wetlands here. As an archaeologist I do like knowing the early history of places like this. (with no ipod I was trying to get my mind on something). The Indians were chucked out when the land was deeded to one very happy Sergeant Peralta in 1810. He got his comeuppance in 1848 when squatters moved in during the gold rush and battled for nearly ten years to get a judge to get them off. After that his children started bickering over the land and the drama continued ..just recently of course the land was encamped by Occupy. It was called Lake Peralta until Mayor Merritt funded an operation to turn it into a center of civic pride in the 1870s. Now wait for it..he pushed for it to be made a hunting free, wildlife refuge (the first in North America) as the place was teaming with wildlife and he wanted to avoid ‘the danger of gunfire so close to the city’. Oh the irony. Suddenly the course was lined with people shouting things like ‘you can smell it’ and people doing the shorter events became increasingly evident, adding a lovely burst of speed and energy. The race asked marathoners to put a ‘full’ sign on their backs. I’ve not been in a race that does this before but it was good, it helps to know who is doing what. It popped into my head while I was running how poignant it would be if you suddenly saw one saying ‘empty’.The last half mile was tough. I tried to appreciate the beauty of the lake-side path and bridge over the water, but was starting to dig for the will to go on by singing ‘The Eye of the Tiger’ in my head when I was suddenly refreshed by a moment of comic relief. With .2 of a mile to go Mr 3.10 hurtled by me with his little sign, he was making death throe type noises but he was really going for it and I cheered him on. I spoke to him later and he had been stopped for a full 5 mins so he had really done well to make it so close to his time. He had not particularly enjoyed his morning. a just a few minutes behind me. 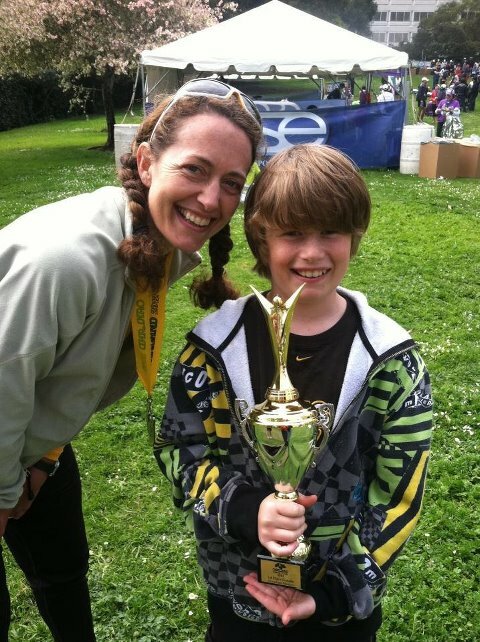 I got an excitingly shiny trophy for being third lady and as this race sensibly doesn’t give masters to position winners, Sarah won the masters trophy which – I enjoyed teasing her afterwards – was a great deal sexier than mine. I think she should have it made into a hat for the next royal wedding. 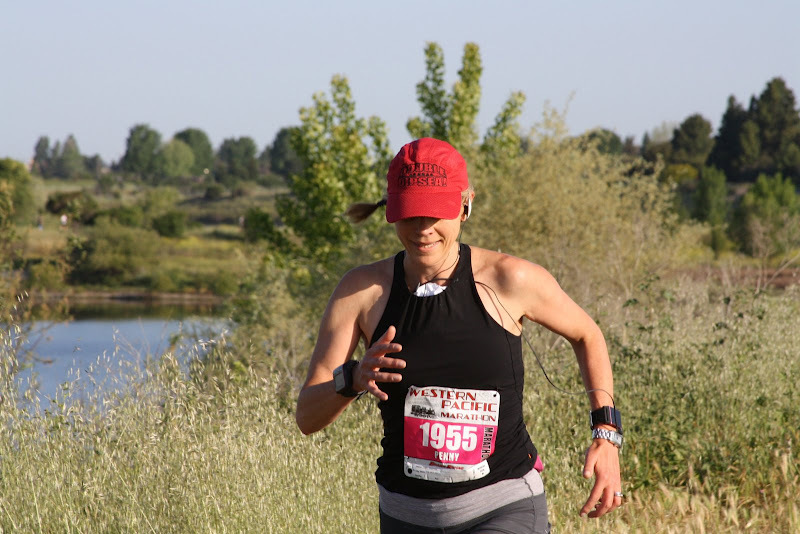 Reading her blog I was delighted to recognize a blind addiction to running defying medical advice and tendancy to regard physical pain – especially during this event – as an irritant rather than a reason to stop that makes me look tame and sensible. She is training for a 100 k run, I suspect she will nail it. It looks like I will receive $300 prize money though it’s not in my paw yet. If I do I look forward to putting some of this back to support Oakland through the Ella Baker Center. http://ellabakercenter.org/ This is a very fine organization, one I had not heard of before attending the marathon expo. It is really impossible not to be humbled by the importance of their work with young people on the streets and in the prison system in Oakland and California. Saturday, March 3rd 2012. San Pedro Valley Park, Pacifica. Traditionally I start Costal Trail events with some mishap. 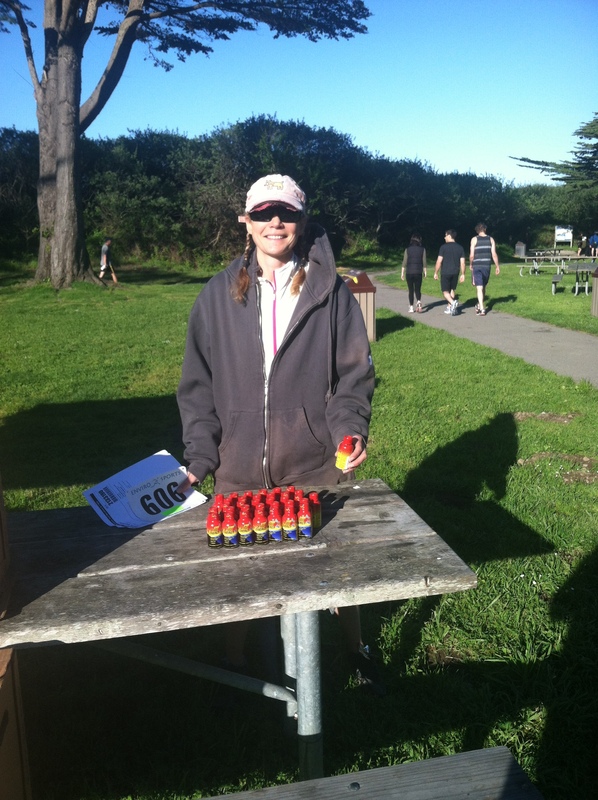 At Crystal Springs I squirted Icy Heat gel into my eye while investigating how to open the tube moments before the race began. At Montara I lost my hanky. A minor thing for most people, this is a disaster for me as (bizarrely) I only have half a functional nose and it streams as soon as I start running. No hanky means no breathing. I was auditioning various items in the car to be replacements …tissues are useless as they become saturated with sweat…a diaper was a serious contender…then I found the hanky lying under my car..I mean how on earth did it get there?? with two minutes to go. 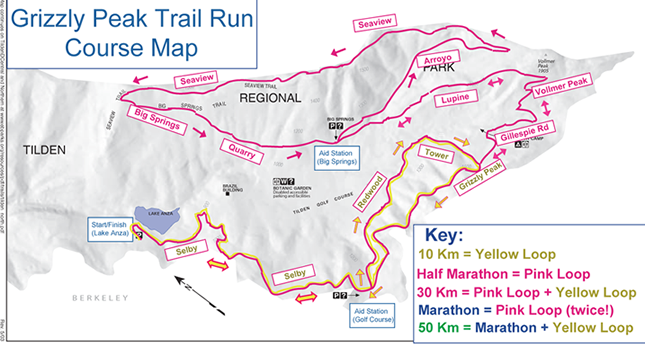 The course (http://www.coastaltrailruns.com/mm_montara_mountain.html is a series of hills forming a half marathon course. A big hill, a teeny one and then a medium one. 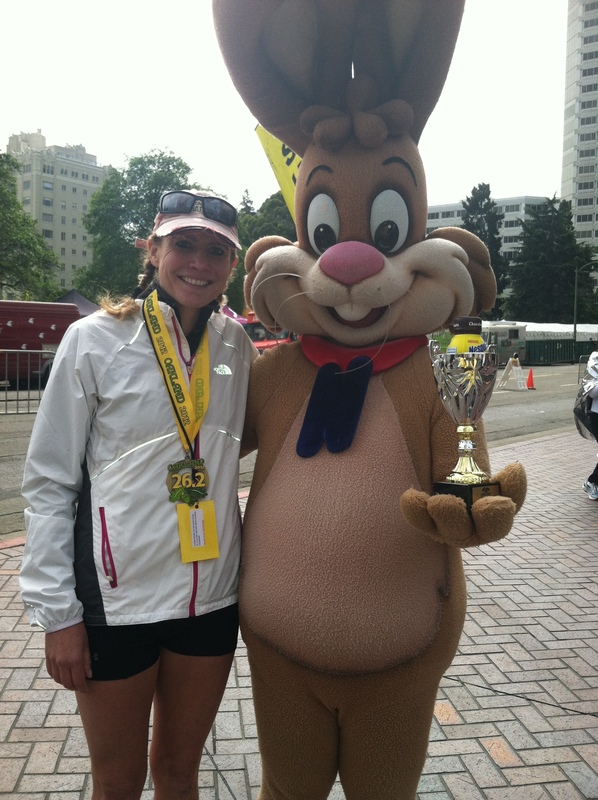 Marathoners repeat them all, 50K runners do the same and then hit the medium one again. This really is the kind of run where you can help yourself by being strategic when you deploy your energy gels. At least with a repeating course you can learn from your mistakes. (Here I learned to fuel up for that third hill as I fizzled out on it during the first loop). The first and big hill one is like a friendly giant. It is a long hill but divides into clear sections which give you a wonderful sense of achievement and anticipation as you gradually rise to North Peak. The top section is glorious. An open expanse of fire road slashed in rock, much of it is gleaming white in the sun – almost like a glacier. The views are stunning and you get to soak them in while you are running, even if you are not the kind of runner who likes to stop. I found it rather sweet that we got to pick up an orange rubber band on the first visit to the top and a purple on the second. (Note on this, like most people I put them on my wrist initially which for me was a mistake. My wrists are not particularly big but my hands do tend to swell towards the end of a marathon and I was startled to realise I had given myself a huge throbbing hand an hour later. So I moved them to a finger which was fine and then ..a fun option for ladies …to the end of my braids). Flying back down from North Peak (above) is tremendous fun. For serious competitors it’s a chance to see how hard you have to work to catch the leaders and to eyeball how fresh the meat is creeping up behind you. But that really isn’t the style of these events overall. There is always good banter when runners get to pass each other and it is important to stress just what a lovely mix of people join in at these events. Everyone benefits from being encouraged by each other. The sense of competition is just right, enough of a race for the lead people to be pushed but the type of event where first timers or people who intend to hike parts feel in good company. Everyone has their own challenge and everyone is respected for being there and achieving their own goals. The lower section of the descent from North Peak is a blast – you hurtle around gloriously pungent Eucalyptus trees in a fast series of switchbacks. At the bottom you have an odd little portion on flat ground (it is hard to adjust after being downhill for so long), there is time for a tantalizing glimpse of your getaway car in the parking area and the finishing line before you pass the refreshments table and head up the smallest of the three hills. As runners pass this station on every loop and are visible for a decent length of time it makes the event more interesting than some for supporters. Small children will find it fun to sneak the candy, energy bites and gels! On a repeating course I like to name things and pick features to revisit as little mental goals along the way. I named the first hill the Gentle Giant, the second The Pimple and the third The Zit. The second is not a big deal, up up up, down down down, you can cope with that. The third, charmingly named Hazelnut is hideous. Absolutely hideous. I suppose by that stage your legs are tired so it is unfair to blame the hill entirely but I will anyway. The gradient is more difficult to get comfy on, there is an endless series of similar looking evil switchbacks which lure you into thinking you have reached the top over and over again. I started naming the switchbacks ‘Git’ , ‘Frog leg’, ‘Rat Face’ etc towards the end and searching for distinguishing signs to entertain myself. Then, oh joy, it is all suddenly over and you can relax into bouncing along a delightful downhill, interrupted only by a stunning excursion through a grove of Eucalyptus trees. On your final loop this downhill makes for a joyous finish. If you are thinking about doing this race do it. I would push you to consider the half marathon rather than the 10K which doesn’t have the nicest bits of course. Forgive the Zit and form a memory to cherish zooming down North Peak. I gave Wendell a big kick on the shin for making me run up The Zit twice, it made me feel much better. You might like to try this too. No hazelnuts were hurt in the making of this blog, though a few may be slightly offended.